If the seat a particular category is vacant then the candidates who earlier have not marked (ticked) that category or want to change the category can now give their request for the same to the Chairperson of the Department upto 10:00AM in the 3rd Counseling and the seat(s) will be filled in that category from the vacant seat after exhausting candidates who have already ticked, according to the merit from the received applications on the same day. ​If the seat in single girl child category in B.Sc-Dual Degree is vacant, then at the time of 2nd counseling the coordinator should announce that any candidate who earlier has not marked (ticked) single girl child category can now give the request for the same and fill the seat according to the merit from the received applications in 3rd counseling . COUNSELING SCHEDULE FOR DUAL DEGREE B.Sc (HONS. )- M.Sc. PROGRAMMES IN PHYSICS, CHEMISTRY, MATHEMATICS AND BIOTECHNOLOGY. A. How and where to Apply? Qualifying examinations, i.e.,10th,12th,B.A./ B.Sc./ B.Com./ B.E./ B.Tech./ B.Pharma / B.P.Th./ M.Sc. etc. 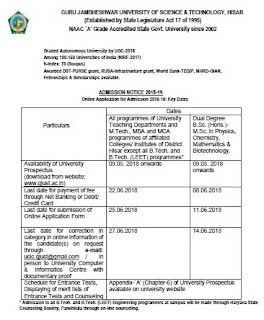 In case of appearing candidates, the Result of first (n-1) semesters/ years of qualifying examination, If the result of nth semester/ Year is not declared on the date of counseling, where ‘n’ stands for total number of semesters/ years of qualifying examinations. Reserved Category (SC/BC/EBP/PH (Differently-abled person)/ ESM/ FF etc. of Haryana) certificate for Reservation in proper format, if applicable. The specimen formats are given as Annexure B-I to B-VIII. Sports certificate, if weightage claimed. Proper “Income” certificate / Affidavit in case of SC/BC /EBP candidates seeking any concession. 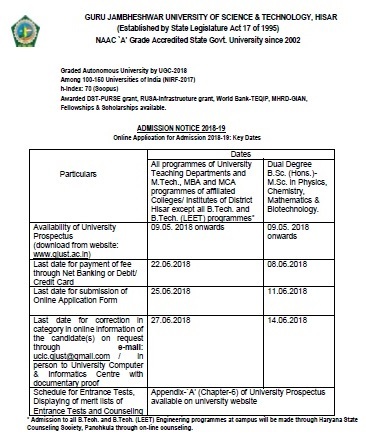 The eligible SC students will submit the SC Scholarship Form at the time of admission/ deposition of fee, which can be obtained from the office of the concerned department and the same is also available on University website www.gjust.ac.in. Character Certificate alongwith attested copy. This First Entrance Test for taking admissions in MBA, MCA-3 year & MCA-5 year thorugh distance education programme is being held on 04/09/2011 at 2.00pm of Guru Jambheshwar University of Science & Tech., Hisar. All students who want to take admission may contact the university or their nearest study centres for their examination.